SAN MARINO, Calif.—Drawing on the unparalleled manuscripts collection on the topic held by The Hunt­ington Library, Art Collections, and Botanical Gardens, a major exhibition will illuminate the remarkable changes wrought in the United States by the planning, construction, and completion of the transcontinental railroad. “Visions of Empire: The Quest for a Railroad Across America, 1840–1880,” on view April 21 through July 23 in the MaryLou and George Boone Gallery, coincides with the 150th anniversary of the 1862 Pacific Railroad Act, which led to the rail connection between the Missouri River and the Pacific Ocean. The exhibition features some 200 items, the vast majority from The Huntington—including maps, photographs, illustrations, newspapers, magazines, letters, and diaries, most of which have never before been on public display. Peter Blodgett, H. Russell Smith Foundation Curator of Western Historical Manuscripts at The Huntington and curator of the exhibition, has chosen to tell a couple of stories. “As much as the exhibition will cover the technological marvels, engineering feats, and entrepreneurial audacity of the railroad age, it also tells the story of how the vision of American continental expansion evolved through a range of historical contexts—from the age of Andrew Jackson through the Gold Rush, Civil War, and Gilded Age of the late 19th century,” says Blodgett. Beginning with the handful of passionate and obstinate dreamers before the Civil War who first imagined a railroad stretching to the Pacific Ocean, “Visions of Empire” portrays the drive to move westward in the face of unrelenting geographic obstacles. Published engravings and original drawings from the 1830s and ’40s depict romanticized landscapes navigable only by foot or on horseback, by wagon or by boat. One such example is the exquisite hand-illustrated diary of British army officer William Fairholme, which captures the landscape of the southern Great Plains in the 1840s; others include several of the hundreds of drawings by gold seeker J. Goldsborough Bruff as he takes part in the harrowing overland migration to Gold Rush California. Karl Bodmer’s hand-colored engravings of steamboats on western rivers from Maximilian of Wied’s Travels in the Interior of North America (ca. 1834) not only represent “one of the first great visual epics of Western American history,” according to Blodgett, but they portray the early appearance of the new technology of steam power beyond the Mississippi, a generation before the arrival of the train. 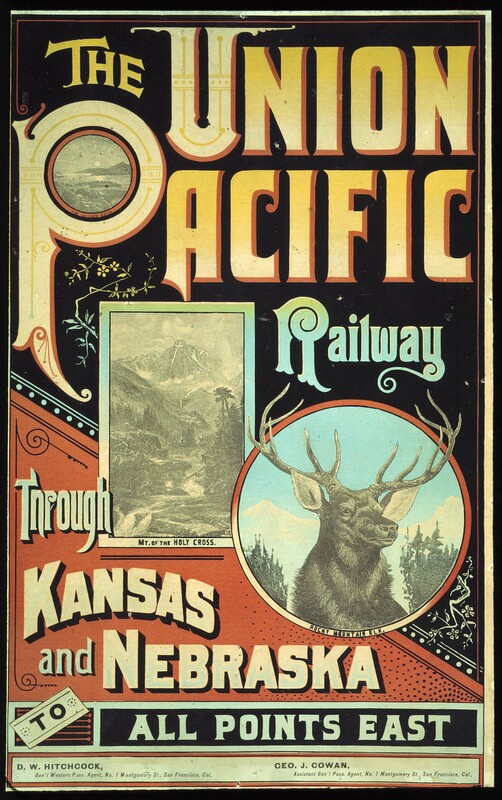 Such images, reflecting the increasing movement of people and goods west in the 1840s, helped to fuel widespread popular debate about railroad expansion across western plains and mountains to the Pacific Coast. In 1845, New York merchant Asa Whitney submitted a petition to the U. S. Congress proposing the construction of a railroad from Lake Michigan to the Pacific Ocean, igniting a debate that would unfold over the ensuing decades. The exhibition features letters, newspaper articles, railroad convention proceedings, and speeches in Congress that depict the points of view in play. These many perspectives echo the multitude of hopes and dreams that different individuals held for their futures, from profit-hungry railroad entrepreneurs and financiers pursuing federal largesse to Chinese and Irish laborers attracted by the promise of work involved in laying nearly 1,700 miles of track. Rare items from The Huntington’s collections will be supplemented with several loans for the installation, including artifacts such as hands tools used by railroad laborers, a payroll sheet for Chinese employees of the Central Pacific Railroad, and advertising cards for clipper ships carrying goods and passengers to Gold Rush California. Part of the exhibition takes a deeper look at the Pacific Railroad and Telegraph Act. Here visitors can engage in exploring physical evidence in a more immersive and interactive mode. Hundreds of the Huntington's Alfred A. Hart photographs will be on view for the first time in a striking wall-sized installation. Some of these will also be able to be seen close-up through a stereographic viewer, a 19th-century apparatus that brings a dramatic three-dimensionality to images of landscapes, laborers, campsites, and supplies of the 19th-century West. Other highlights of this area include a hands-on Morse code station, where visitors can try their hand at the new communications system sweeping the country at the time, and a "walkable" map of the United States tracing the route of the transcontinental railroad. While the development of California and the West provided the allure for a transcontinental railroad, “Visions of Empire” tells an even broader, national story—one tied to the railroad’s place in American aspirations to dominate international trade and commerce with Asia, in the evolving role of the federal government in the life of the nation, and in the efforts to preserve the Union during the American Civil War. A ballot from the presidential election of 1856, showing the last name of Republican John C. Frémont emblazoned across an image of a steaming locomotive, advertises the first national candidate to associate himself with the idea of a transcontinental railroad. Abraham Lincoln, the successful Republican candidate in 1860, signed the Pacific Railroad Act of 1862, mindful of the importance of the West to the preservation of the Union. The launching of the first American transcontinental railroad during the 1860s represented a new and dynamic phase in the enduring struggle among Americans over what role they imagined government should play in building a nation and shaping a social order. “Visions of Empire” depicts the monumental challenges faced by this great enterprise, as captured in survey reports, engineering sketches, treaties with Indians, photographs and engravings of toiling construction crews, and correspondence highlighting the triumphs and travails of the so-called Big Four—Mark Hopkins, Charles Crocker, Leland Stanford, and Collis P. Huntington (uncle to Henry E. Huntington, founder of The Huntington). Elsewhere in the exhibition, maps, photographs, and political cartoons trace the progress of this great endeavor and evolving popular attitudes toward it. Early maps offer glimpses of the young American republic pushing its web of market places and depots westward, while later versions depict the routes and towns that proliferated from Missouri to California in the wake of the meeting of the Union Pacific Railroad and the Central Pacific in 1869. Similarly, during the 1850s and early ’60s, publications such as Harper’s Weekly, Leslie’s Illustrated News, and the London Illustrated News portrayed these events in human terms through detailed engravings based on the burgeoning practice of photography. By the late 1860s, as photographic technology advanced, book publishers began issuing volumes filled with massive plate photographs, such as Andrew J. Russell’s The Great West Illustrated (1869). While many of those photographs echoed images from the 1840s with their romanticized views of the open landscape, many also captured the human toll of the brutal labor required to span the continent. Cartoonists, such as the celebrated Thomas Nast, added yet another layer of interpretation for readers as they mocked wealthy businessmen, lampooned corrupt politicians, or demonized Chinese immigrants. Long before the last spike was hammered in place, when the east- and westbound tracks finally met at Utah’s Promontory Summit on May 10, 1869, the first locomotives traveling west unleashed irrevocable social, political, and economic changes. Completion of this initial enterprise only accelerated the pace of such changes, including the inauguration of other transcontinental lines. To illuminate the decade following completion of the transcontinental railroad, “Visions of Empire” incorporates the letters and diaries of engineers, travelers, and investors who experienced first-hand the triumphs and the failures that characterized this massive undertaking. Outlining the rise of new railroads, communities, and industries across the West, it emphasizes the rapid pace of change in the 1870s spurred by this crossing of the continent. 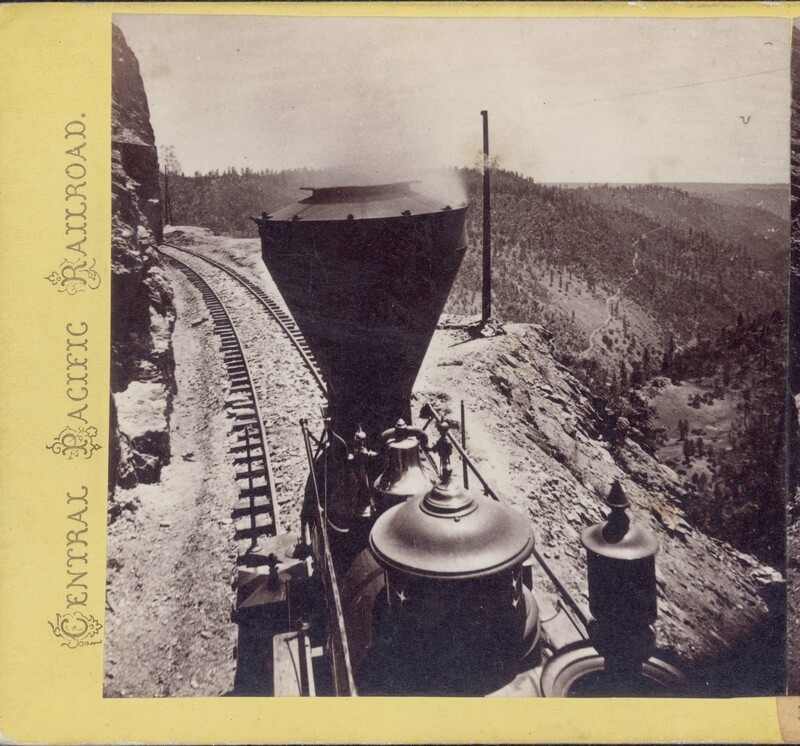 The era of exploration and discovery had quickly given way to a new age of tourism, as travelers could now see captivating landscape from their railroad car windows rather than simply in books or newspapers. Transportation became associated with luxury, as railroad lines used gloriously colorful lithographic posters to advertise the comforts of traveling east to west—and west to east—in elegant compartments and dining cars. Contrasting with Whitman’s exuberant and celebratory prose, however, are other texts that remind the viewer of the inextricable link between the expansive march of railroads across the West and the conquest of native peoples such as the Sioux and the Cheyenne, the corruption of politicians and corporate officials, and the havoc wrought by the unceasing exploitation of the land and its resources. The Presenting Sponsor of this exhibition is the Union Pacific Railroad. Major support is provided by the Henry Mayo Newhall Foundation. Additional support is provided by Judi and Bry Danner, the Ahmanson Foundation Exhibition and Education Endowment, and Robert London Moore Jr.
May 7 (Monday) 7:30 p.m. Historian Richard Orsi, author of Sunset Limited: The Southern Pacific Railroad and the Development of the American West, 1850–1930, will discuss his continuing research into the ambiguous environmental legacy of western railroads. Although the source of great havoc in wilderness landscapes, farmlands and cities, these enterprises also encouraged more modern and balanced environmental practices and more “sustainable” human relationships with nature. A book signing follows the talk. Free; no reservations required. Friends’ Hall. 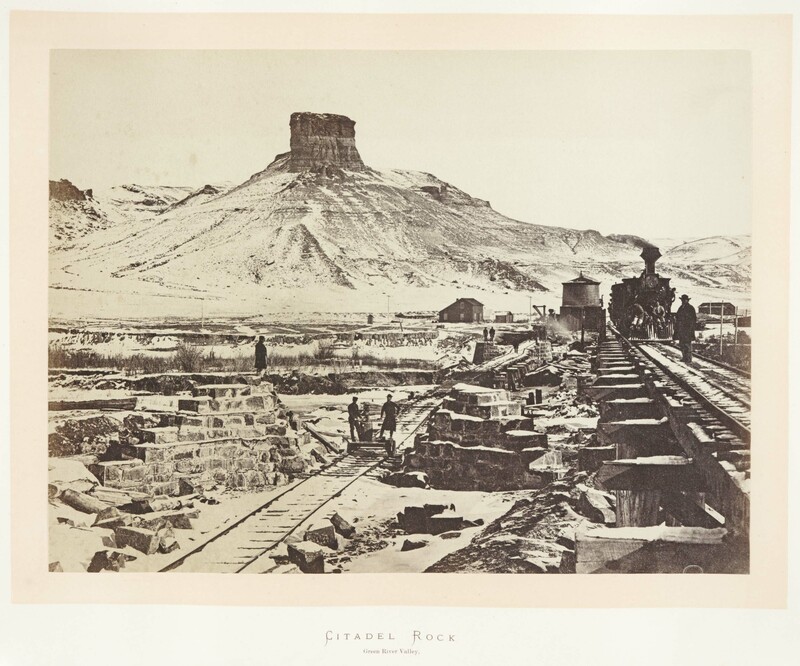 May 10, 17, and 24 (Thursdays) 10–11:30 a.m.
Join curator Peter Blodgett for a three-part lecture series that will include topics such as the construction of the first transcontinental railroad, the influence of railroads on America’s visual culture, and the promotion by railroads of tourism in the 19th-century American West. Each illustrated talk will be followed by a discussion in the gallery. Members: $55. Non-Members: $65. Registration: 626-405-2128. June 7 (Thursday) 4:30–5:30 p.m.
Join curator Peter Blodgett for a private tour of the exhibition and gain insights into The Huntington’s unparalleled resources of letters, diaries, tourist guidebooks, travel narratives, railroad posters, and stereographic photographs. This exceptional collection of materials illuminates the remarkable changes wrought in the United States by the transcontinental railroad. Members: $15. Non-Members: $20. Registration: 626-405-2128. Pack your bags for an adventure into the world of railroads as we embark on an exploration inspired by the exhibition. With instructor Laura Moede, each class includes a visit to the garden or gallery, art projects, stories, and more. Fee includes one accompanying adult. Ages 3–4. Members: $85. Non-Members: $95. Registration: 626-405-2128. May 23 (Wednesday) 3:30–4:30 p.m.
Travel back to the days of steam engines and railroads. Using stories and art activities and a visit to the exhibition, young engineers will journey into the world of travel in this class led by instructor Laura Moede. Ages 5–6. Fee includes one accompanying adult. Members: $15. Non-Members: $20. Registration: 626-405-2128. May 26 (Saturday) 10 a.m.–1 p.m. Explore the role the railroad played in American dining habits while viewing the exhibition. After a visit to the gallery with chef and art educator Maite Gomez-Rejón of ArtBites, teens can learn some basics in the kitchen while preparing comforting American cuisine inspired by 19th-century cookbooks. Ages 14–17. Members: $60. Non-Members: $70. Registration: 626-405-2128. 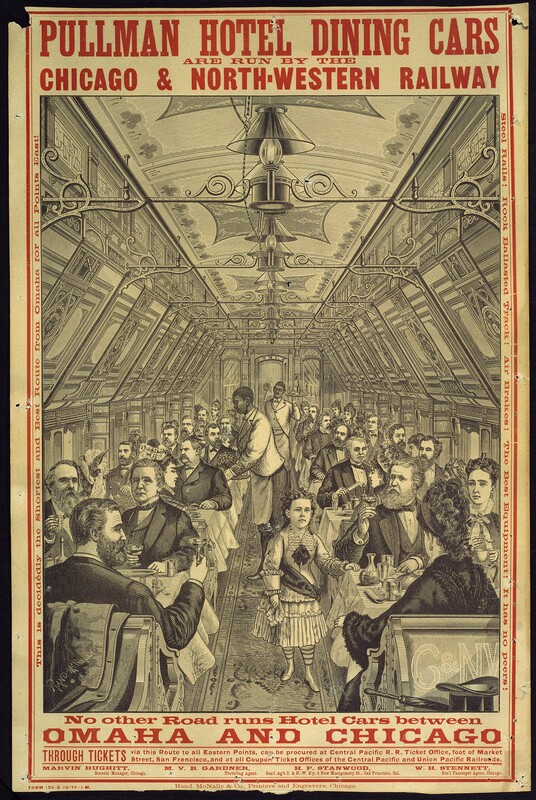 June 16 (Saturday) 9 a.m.–12:30 p.m.
Join Maite Gomez-Rejón of ArtBites and explore the role the railroad played in the development of eating and dining habits in America. After the gallery conversation, prepare American comfort food inspired by 19th-century cookbooks. Members: $80. Non-Members: $90. Registration: 626-405-2128. The Huntington is located at 1151 Oxford Rd., San Marino, Calif., 12 miles from downtown Los Angeles. It is open to the public Monday, Wednesday, Thursday, and Friday from noon to 4:30 p.m.; and Saturday, Sunday, and Monday holidays from 10:30 a.m. to 4:30 p.m. Summer hours (Memorial Day through Labor Day) are 10:30 a.m. to 4:30 p.m. Closed Tuesdays and major holidays. Admission on weekdays: $15 adults, $12 seniors (65+), $10 students (ages 12–18 or with fulltime student I.D. ), $6 youth (ages 5–11), free for children under 5. Group rate $11 per person for groups of 15 or more. Members are admitted free. Admission on weekends and Monday holidays: $20 adults, $15 seniors, $10 students, $6 youth, free for children under 5. Group rate $14 per person for groups of 15 or more. Members are admitted free. Admission is free to all visitors on the first Thursday of each month with advance tickets. Information: (626) 405-2100 or huntington.org. Alfred A. Hart, Locomotive "Gov. Stanford," ca. 1865 (detail). 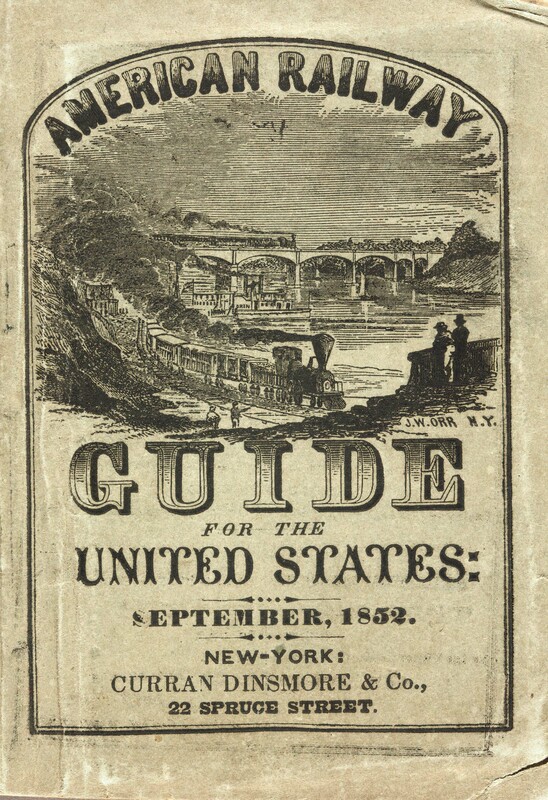 American Railway Guide for 1852. Huntington Library, Art Collections, and Botanical Gardens. 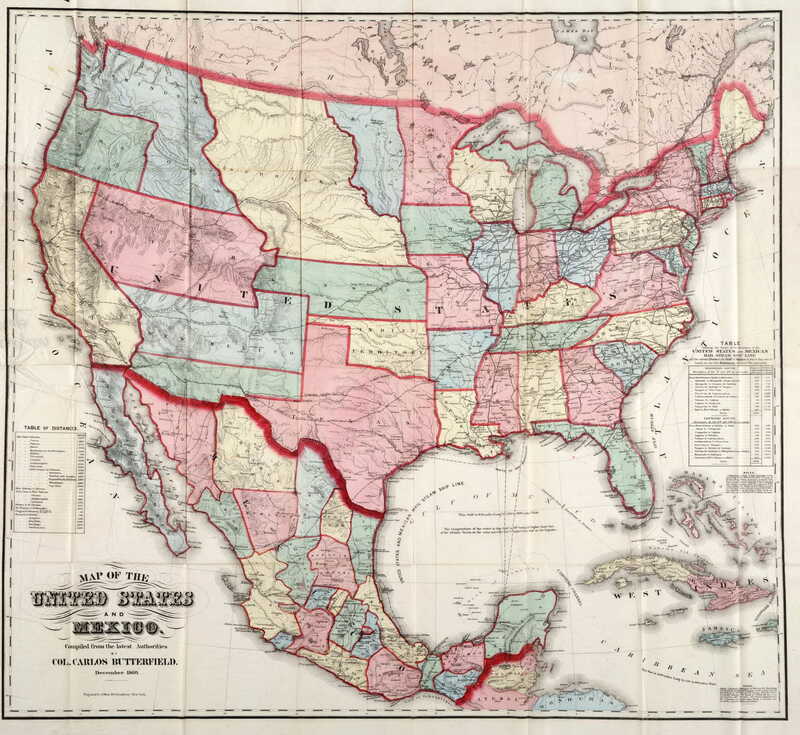 Carlos Butterfield, Map of the United States and Mexico, 1860. Huntington Library, Art Collections, and Botanical Gardens. Alfred A. Hart, Locomotive "Gov. Stanford," ca. 1865. Huntington Library, Art Collections, and Botanical Gardens. 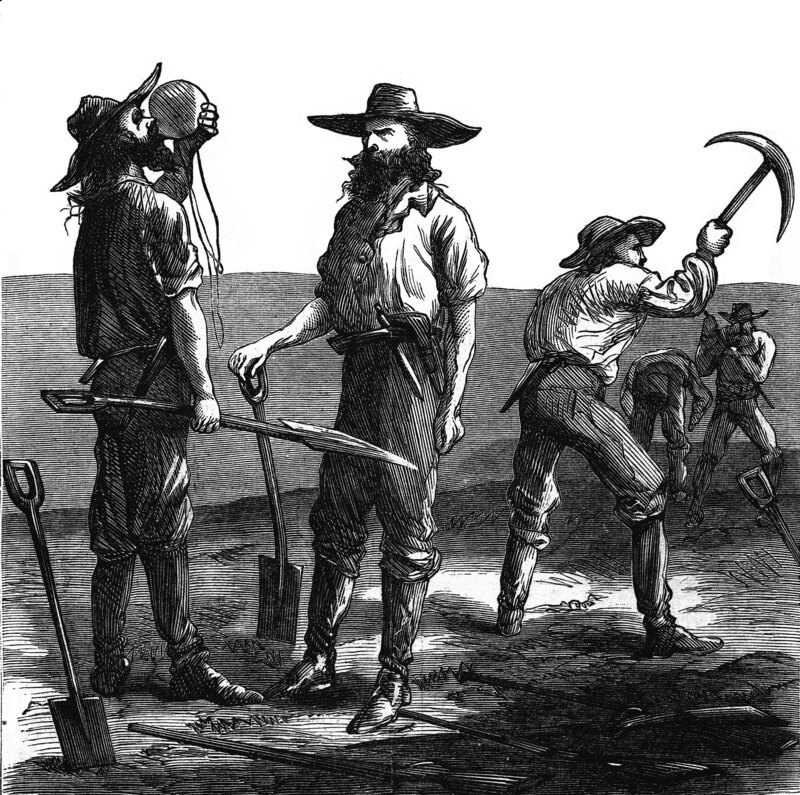 Theodore R. Davis, Group of Workmen on the Union Pacific Railroad, 1867, from Harper’s Illustrated Weekly Magazine. Huntington Library, Art Collections, and Botanical Gardens. Alfred A. Hart, Rounding Cape Horn, stereograph, ca. 1868. Huntington Library, Art Collections, and Botanical Gardens. Andrew J. Russell, Citadel Rock, 1868, from "Sun pictures of Rocky Mountain Scenery" by F. V. Hayden. Huntington Library, Art Collections, and Botanical Gardens. 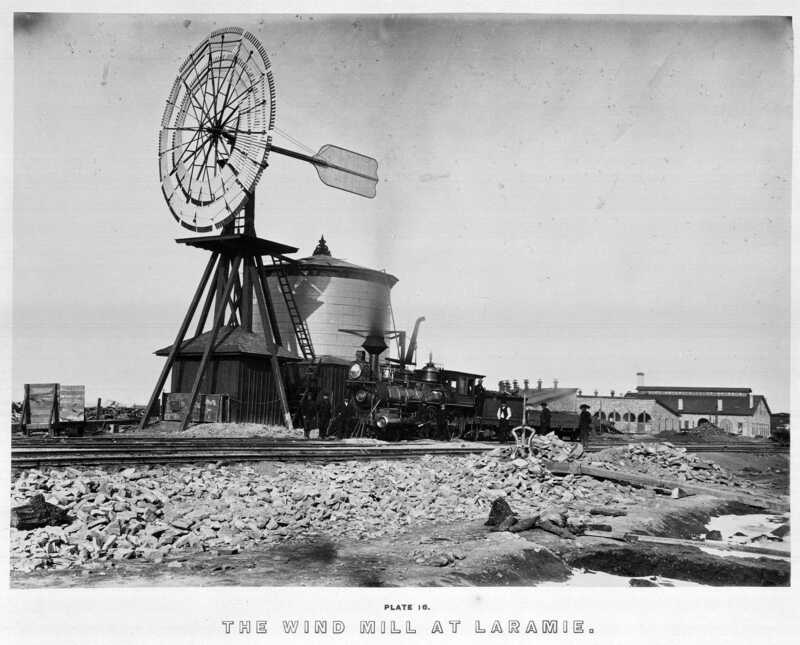 Andrew J. Russell, Wind Mill at Laramie 1868, from "The Great West Illustrated." Huntington Library, Art Collections, and Botanical Gardens. 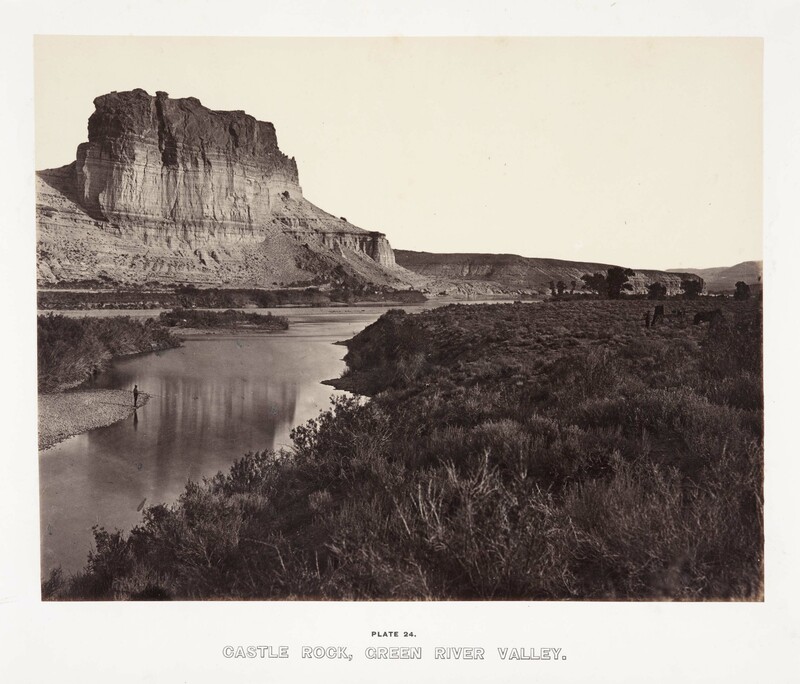 Andrew J. Russell, Castle Rock, Green River Valley, from "The Great West Illustrated," 1869. Huntington Library, Art Collections, and Botanical Gardens. Andrew J. Russell, Malloy’s Cut, from "The Great West Illustrated," 1869. Huntington Library, Art Collections, and Botanical Gardens. 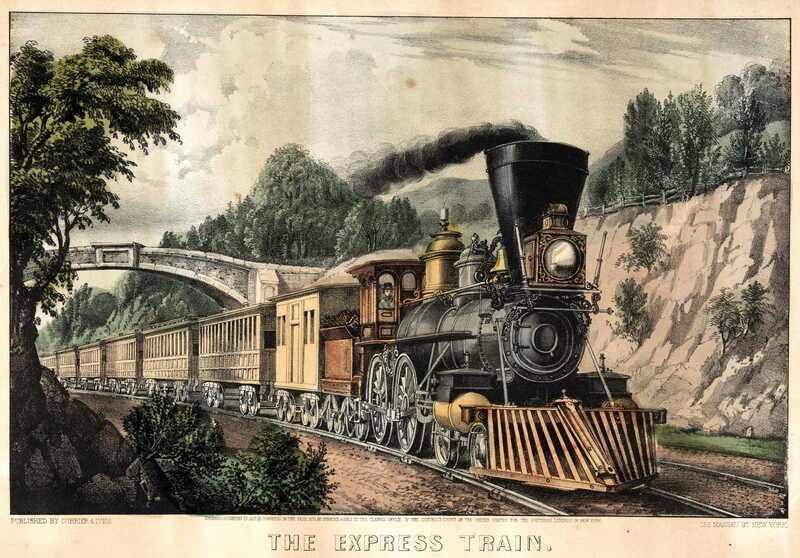 Currier & Ives, The Express Train, hand colored lithograph, 1870. From the private collection of James Brust. 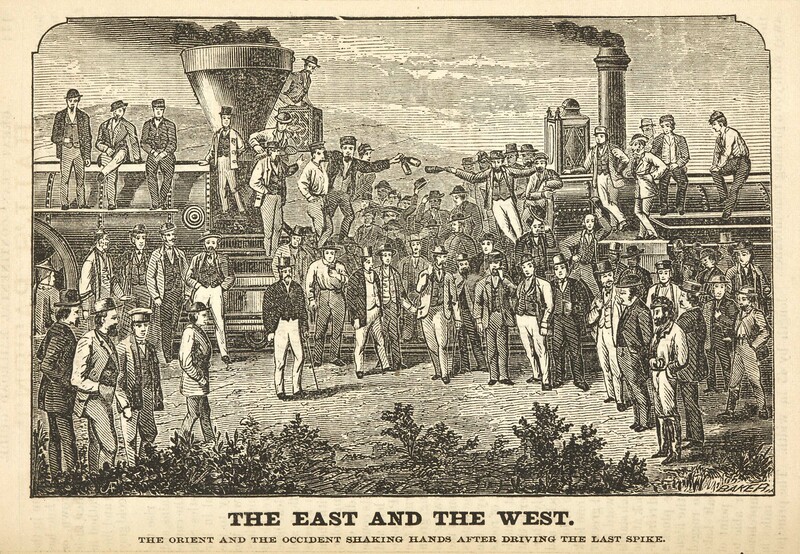 The East and the West—The Last Spike, from George Crofutt, Great Trans-Continental Tourist Guide (New York, 1870). Huntington Library, Art Collections, and Botanical Gardens. The Union Pacific Railway through Kansas and Nebraska, unknown artist, date unknown. Huntington Library, Art Collections, and Botanical Gardens. Pullman Hotel Dining Cars Are Run by the Chicago & North-Western Railway, unknown artist, ca. 1887. Huntington Library, Art Collections, and Botanical Gardens. Images courtesy of the Huntington Library, Art Collections, and Botanical Gardens, (c) The Huntington. William Bayard (1814–1907): New York businessman who was involved in promoting various transportation schemes. In 1849, he went before Congress to propose a railroad route to carry the U.S. mail as well as passengers, and later, in 1856, he proposed a stagecoach route from Missouri to California for the same purposes. Asa Whitney (1797–1872): New York merchant and one of the earliest promoters of a transcontinental railroad. George Wilkes (1817–1885): New York newspaperman who edited a string of papers. In 1845, he published A History of Oregon, Geographical and Political. That same year, he published an extract from that work titled A Project for a National Railroad from the Atlantic to the Pacific Ocean. It was very popular and was in its fourth edition by 1847. Charles Crocker (1822–1888): Initially served as construction supervisor of the Central Pacific Railroad and later as president of one of its subsidiaries, Charles Crocker & Co. Later he became a shareholder of Wells Fargo and eventually held controlling interests in several banks, including Crocker Bank. Mark Hopkins (1813–1878): Founded the New England Mining and Trading Co. after the California Gold Rush and later became a merchant in Sacramento in the 1850s. In 1855 he partnered with Collis P. Huntington by forming Huntington Hopkins and Co. He served as the treasurer of the Central Pacific. Collis P. Huntington (1821–1900): In addition to helping to build the Central Pacific, Huntington also helped establish other lines, including the Southern Pacific Railroad and the Chesapeake and Ohio Railway. He was the uncle of Henry E. Huntington (1850–1927), founder of the Huntington Library. Leland Stanford (1824–1893): Before joining his three associates in the Central Pacific Railroad venture, Stanford worked as a lawyer in Wisconsin and then as a merchant in Sacramento in the 1850s. He served briefly as president of the railroad, until 1862, when he was elected governor of California. After leaving politics he served as president of the Southern Pacific. He and his wife founded Stanford University in 1885 in tribute to their son, who died of typhoid at the age of 15. Oakes Ames (1804–1873): As a congressman from Massachusetts, he was a strong advocate of the Union Pacific Railroad and later was caught up in the scandals of Crédit Mobilier, a business venture that led to one of the great scandals of the 1870s. Oliver Ames (1807–1877): Brother of Oakes Ames. President of the Union Pacific at the time it joined the Central Pacific. He and Thomas Durant had a contentious relationship vis-à-vis the Union Pacific and Crédit Mobilier. Grenville Dodge (1831–1916): A Union Army officer, U.S. congressman, and chief engineer of the Union Pacific. He is featured in a famous photograph (By Andrew J. Russell) shaking hands with Samuel S. Montague at the Golden Spike ceremony at Promontory Summit, Utah, on May 10, 1869. Thomas Durant (1820–1885): Served as vice president of the Union Pacific in 1869 when it joined the Central Pacific at Promontory Summit in Utah. Among his financial dealings was the creation of Crédit Mobilier. Jack and Dan Casement: Brothers who oversaw the construction of the Union Pacific. Jack (1829–1909) was a former general in the Union Army during the Civil War and oversaw construction from Fremont, Neb., to the railroad’s completion at Promontory Summit, Utah. Dan (1832–1881) financed the operation. Lewis M. Clement (1837–1914): As construction engineer for the Central Pacific, Clement helped plan and build the route through the Sierra Nevada mountains and the deserts of the Nevada and Utah territories. Theodore D. Judah (1826–1863): The first chief engineer of the Central Pacific who also directed the survey that determined the route of the railroad over the Sierra Nevada mountains. Samuel Skerry Montague (1830–1883): Chief Engineer of the Central Pacific, specifically the western half. Currier & Ives: An American printmaking firm based in New York City and headed by Nathaniel Currier (1813–1888) and James Merritt Ives (1824–1895). Active from 1834 to 1907, it produced lithographs of everything from paintings by fine artists to popular advertisements. Alfred A. Hart (1816–1908): Photographer known for his stereo views of the construction of the Central Pacific in the 1860s. Andrew J. Russell (1830–1902): An American photographer best known for his images of the Civil War and the Union Pacific. One of his most iconic images features the joining of the rails at Promontory Summit, Utah. William Blackmore (1827–1878): English lawyer and promoter of investments in the post–Civil War American West; noted for his failed investment related to the Denver and Rio Grande Western Railroad. George Crofutt (1827–1907): Publisher of The Great trans-continental tourist's guide . . . from the Atlantic to the Pacific Ocean (1870) and Crofutt’s trans-continental tourist's guide . . . over the Union Pacific railroad, Central Pacific railroad of Cal., their branches and connections by stage and water (1874). His pioneering work in developing railroad guidebooks proved a significant contribution to tourism and travel in America. Samuel R. Curtis (1805–1866): A Union Army general in the Trans-Mississippi Theater of the Civil War, Republican member of Congress, and railroad promoter. He chaired the Select Committee of the House of Representatives on the Pacific Railroad in 1860, twice introduced legislation to facilitate construction of a transcontinental railroad (which became the basis of the eventual Pacific Railroad Act) and was deeply involved in the promotion of railroads in Iowa, an interest he maintained during his military service in the Civil War. Thomas L. Kimball (1831–1901): As an official for two of the most prominent American railroads, the Pennsylvania Railroad and the Union Pacific Railroad, he worked with such well-known railroad men as Thomas Scott and Jay Gould. Robert Strahorn (1852–1944): Author of promotional pamphlets about the West. 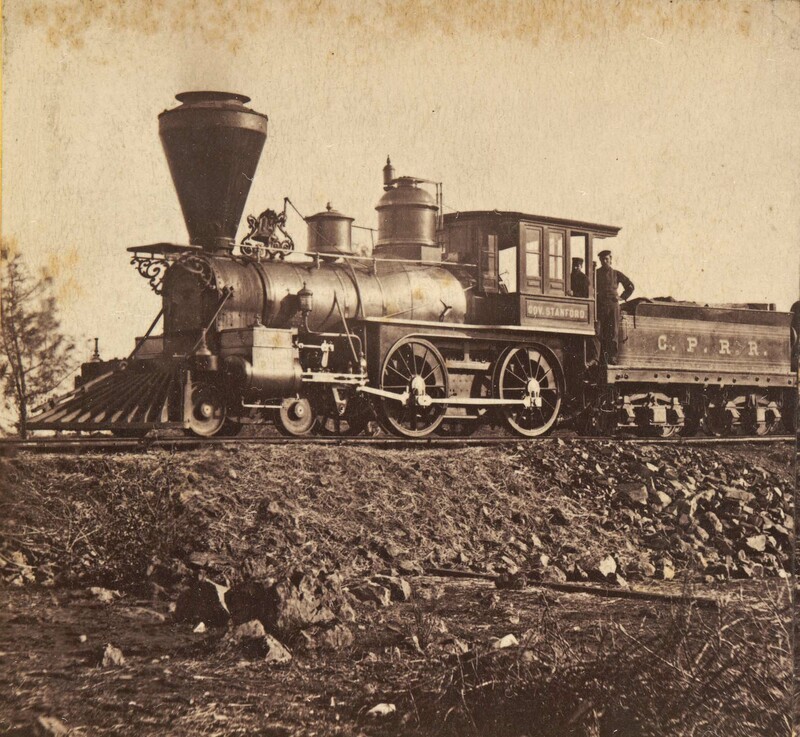 Employed by the Union Pacific, Strahorn represented an important type of publicist who aggressively promoted the states, territories, and regions served by various railroads in hopes of encouraging investment, settlement, and tourist travel. Charles Francis Adams Jr. (1835–1915): Great grandson of John Adams and grandson of John Quincy Adams; he served as a colonel in the Union Army during the Civil War and as president of the Union Pacific in the late 1880s. He also served on the Massachusetts Railroad Commission, a state regulatory body. He was a vocal critic of railroad companies’ financial manipulations, which produced great profits for owners and investors while burdening the railroads with excessive debts to be paid off by customers. Henry George (1839–1897): Writer and political economist best known for his treatise Progress and Poverty (1879), which addressed the cyclical nature of industrial economies. He was a vociferous critic of the railroads. The first steam locomotive in the United States carries passengers and goods between Baltimore and Ellicott’s Mills, Md. Settlers begin migrating west across the Great Plains and Rocky Mountains on the Oregon-California Trail. Asa Whitney presents his first resolution to Congress proposing the funding of a railroad to the Pacific. Gold is discovered in northern California. California becomes the 30th state admitted into the Union. Agitation for a transcontinental railroad to link California to the eastern states soon follows. Abraham Lincoln elected president of the United States. Several southern states will secede from the Union in response over the next few months. Engineer Theodore Judah meets Sacramento merchant Collis P. Huntington, who agrees to invest in a new railroad project. Huntington is joined by Mark Hopkins, James Bailey, Charles Crocker, and Leland Stanford to form the first board of directors of the Central Pacific Railroad. Confederate troops fire on Fort Sumter, the U.S. military installation in the harbor of Charleston, S.C., initiating the American Civil War. Lincoln signs the Pacific Railroad Act. The document recognizes Central Pacific efforts to build the California line while simultaneously chartering a Union Pacific Railroad Co. to build west from the Missouri River. The act grants each enterprise 6,400 acres of land and up to $48,000 in government bonds per mile built, depending on the nature of the terrain. The Central Pacific lays its first rails in Sacramento, Calif.
Financier and railroad promoter Thomas C. Durant, an active investor in Midwestern lines, arranges for his appointment as vice president and general manager of the Union Pacific Railroad. Congress passes a revised Pacific Railroad Act. It doubles the land grant, cedes all natural resources on the line to the railroads, and removes limitations on individual stock ownership. Having previously organized a separate company named Crédit Mobilier of America, Durant and a few associates arrange for it to obtain the contract for building the Union Pacific. Doing so allows Durant and investors in Crédit Mobilier to profit from the railroad’s construction, no matter the company’s financial difficulties. Central Pacific begins using Chinese workers. Confederate Gen. Robert E. Lee surrenders to Union Army Gen. Ulysses S. Grant. Union Pacific begins laying tracks line in Omaha, Neb. Central Pacific crews begin tunneling through the Sierra Nevada using a workforce primarily composed of Chinese immigrants. Union Pacific crews pass the 100th meridian line on the prairies of Nebraska. Central Pacific completes Summit Tunnel in the Sierra Nevada mountains. Crédit Mobilier announces a hefty dividend to its investors. Various members of Congress acquire shares in the firm through the auspices of their colleague Oakes Ames. Ames, seeking to obtain allies for the Union Pacific, thus inadvertently lays the groundwork for one of the greatest political scandals of the 19th century. Union Pacific construction reaches the highest point on both lines, Sherman Summit, at an elevation of 8,200 feet in the Rockies. Central Pacific crews lay a remarkable 10 miles of track in one day. The Central Pacific and Union Pacific railroads join together at Promontory Summit, Utah. The news media break the story on the Crédit Mobilier scandal, implicating a number of government officials, including Speaker of the House James G. Blaine of Maine, Vice-President Schuyler Colfax of Indiana, senator and Republican vice-presidential candidate Henry Wilson of Massachusetts, and Rep. James A. Garfield of Ohio. A Congressional committee investigates Crédit Mobilier, although few suffer any consequences, with the exception of Oakes Ames, who is censured by the House. Excessive investment in railroad stocks contributes to financial instability in the United States, including a lack of capital. The American economy soon enters a lengthy and devastating national depression. The Southern Pacific Railroad, connecting with the Texas and Pacific lines, establishes the second transcontinental link. Congress passes the Chinese Exclusion Act, which bans immigration of Chinese laborers into the United States for a period of 10 years. Congress will extend this act in 1892, and again indefinitely in 1904. The Northern Pacific completes its main line from the Great Lakes to the Pacific with its own “golden spike” ceremony at Gold Creek, Mont., completing the third transcontinental railroad. Unlike the first, it is built by a single company, constructing its route from both east and west. Legislation is enacted to create the Interstate Commerce Commission, a federal agency intended to regulate railroad shipping practices, in response to persistent complaints from rural populations about the excesses of railroad corporations, such as discriminatory freight rates. 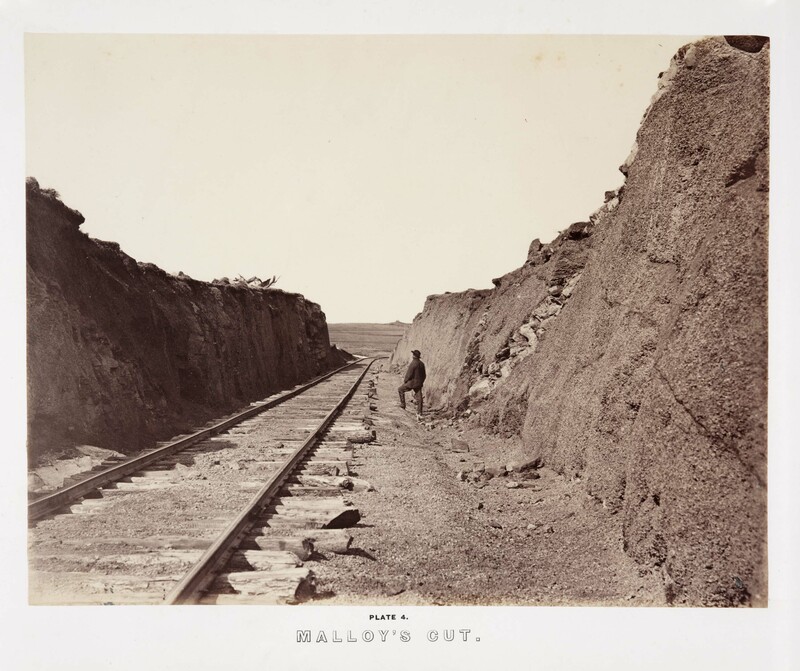 Also see, History of transcontinental railroad examined in major exhibition at the Huntington (artdaily.org).